Regular checkups and wellness exams are the best way to make sure your pet stays as healthy as possible. We start with a thorough history where we discuss with you the health of your pet. We want to know your concerns (if any) you have with your pet, any current medical conditions that he or she may have, as well as any medications or supplements you are currently giving. We then perform a complete physical exam to complete the health profile for your pet. 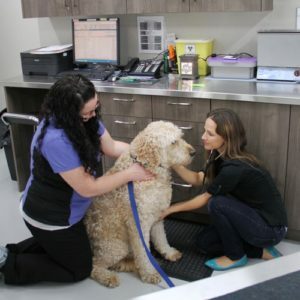 We are able to identify any medical problems or other issues that may negatively impact your pet’s quality of life. Dr. Smith examines a patient. Wellness exams give us the opportunity to get to know your pet. By seeing them on a regular basis and building this relationship, we’re better able to evaluate how your pet’s health is changing over time. These regular visits also give you the opportunity to get to know us. It is important to us that we are meeting your expectations as your “other” family doctor! We encourage you to ask questions so that you become an important partner in your pet’s care. Copyright © 607532 BC Ltd.